At the time being QuantLib’s smallest time resolution is a single day and QuantLib does not support “intraday pricing”. Close to an option’s maturity date this inaccuracy leads to wrong greeks. Especially at maturity date QuantLib gives back zero option npv and greeks. A temporary solution would be to shift the expiry date of the option one day forward but this still leads to wrong valuation of the price and the pin risk of the option. The root of the problem is DayCounter’s yearFraction method, which acts on dates and the Date class does not support any time resolution smaller than days. On the other hand the Date class is probably the most widely used QuantLib class and therefore any solution must be backwards compatible. One solution for this problem has recently been discussed here. and methods to get the differences in days between two points in time including the fractions of the days. The maximal resolution of the methods is either micro or nano seconds depending on the underlying boost installation. The new Date and DayCounter implementation is available here. It acts as a drop-in replacement for the existing classes, meaning the QuantLib test suite runs properly without any changes. Only the day counters Actual360, Actual365Fixed, ActualActual allow a strictly monotone definition of time and only these once have been adapted. The patch also contains an example of an intraday pricing of an ATM option during the last two and a half hours of the last trading day based on the Heston model and the finite difference pricing engine FDHestonVanillaEngine. 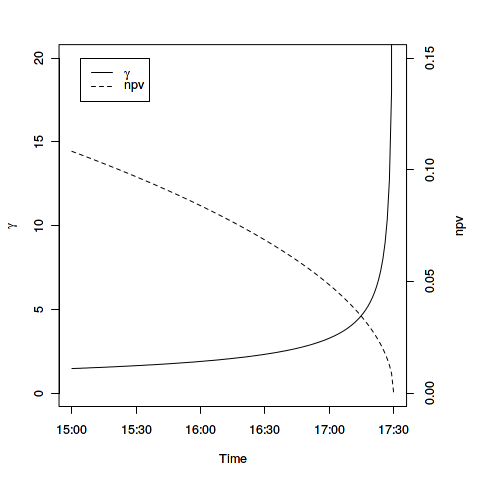 The resulting Gamma and NPV of the option are shown in the diagram below.